A stunning set comprising of a pair of hand made, Czech crystal wine goblets with Swarovski crystal filled stem and silver plating and a matching, Swarovski crystal filled wine bottle stopper. Beautifully presented, nestled in blue gift boxes, the glasses and wine stopper are bound to create the wow factor at the table. The wine goblet stem is brimming with tiny swarovski crystals that glisten away which are finished by a silver plated band to each end of the stem. The base of the glass has three tiny anti slip/anti drip feet preventing your glass from sliding away on a wet surface and also minimising those annoying little condensation drips on your outfit. The multi faceted base of the goblet is hand cut to add that extra bit of elegance to sip your wine in style! Be enchanted by the dream like reflections created by the glistening crystals and faceted crystal top of the wine bottle stopper. 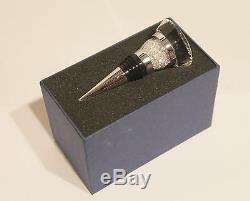 The wine stopper will ensure the aroma of your wine is stylishly contained. Each set comes with a microfibre cleaning cloth. 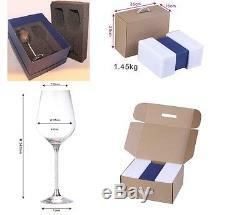 Dimensions: Wine glasses - Height 24cm x 6cm (width at goblet opening). In the unlikely event that one ofyour glasses be broken in transit, we will be happy to replace free of chargeproviding you can send us a photograph of the broken item. If purchasing as a gift we are more than happy to dispatch straight to therecipient. A photograph of the fault will be requested. We are a small family business and pride ourselves in offering a friendly, helpful and efficient service. We welcome your feedback as this helps reassure other potential customers. 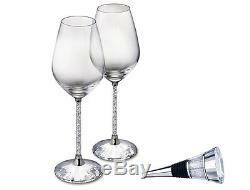 The item "New Pair of Swarovski Crystal Filled Stem Wine Glasses & Wine Bottle Stopper Set" is in sale since Wednesday, November 15, 2017. 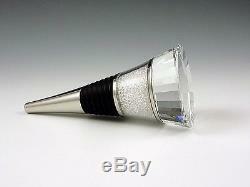 This item is in the category "Pottery, Porcelain & Glass\Glass\Glassware\Other Glassware". The seller is "diamondaffairuk" and is located in Bishops Castle.